If you ever come across a round Hamilton watch with a sweep second hand and manual winding Swiss-made movement you stand a pretty good chance being right if you guess it's a "sea something". There are 43 models in the Hamilton line up with a name that starts with "sea". The first Sea-model was the Seabrook from 1957. The number of Sea-related models increased quickly through the 1960s and continued well into the 1970s. One of the late 1960 "sea something" models is the Seaward II from 1968. It was only available for two years. 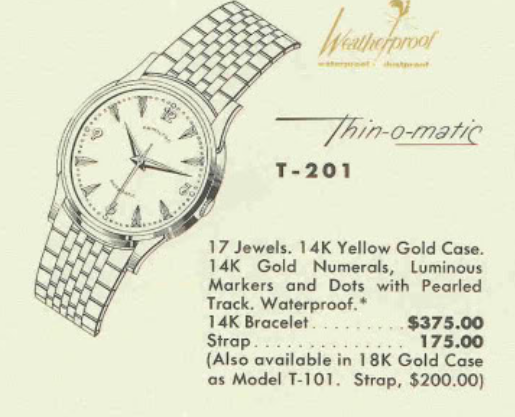 The Seaward II came in a stainless steel case with what appears to be a brushed finish on the bezel, at least according to the catalog depiction. It was available on a strap or on a bracelet. 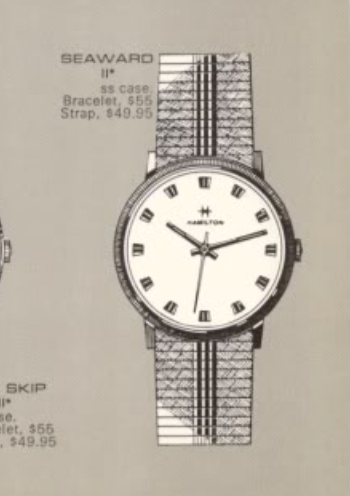 The model was an entry level Hamilton and priced around $50. That may seem cheap by today's standards but that was the equivalent of about $375 in 2017 dollars. That would still make it an inexpensive models by Hamilton's current standards. Tucked inside the one-piece case is a Hamilton 688 manual winding movement based on an ETA grade. You don't tend to see Seaward II's very often. That might be because they are fairly common-looking and may just blend in with all the other round stainless steel watches out there. What is a little unique about the Seaward II's dial is there are no numerals, not even at 12. All the dial features are 12 identical faceted markers at each hour position. 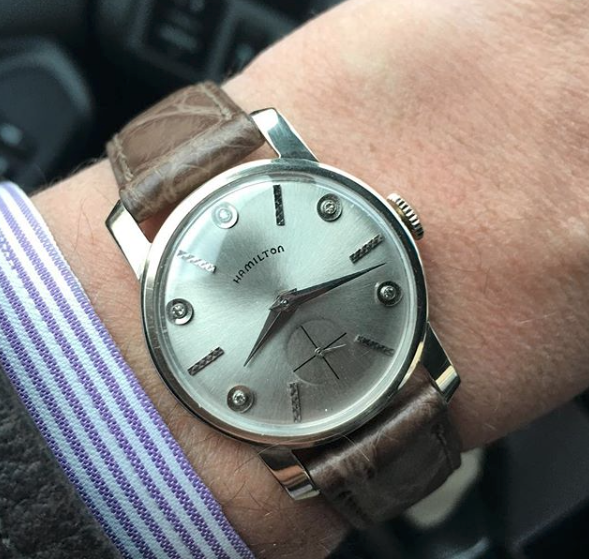 I recently picked up a Seaward II and it arrived in very nice condition. All it really appears to need is a little sprucing up. It's always a good idea to treat a newly acquired used watch to a trip to the spa, regardless of how nice it looks on the outside. Unless you know the watch was overhauled in the last couple of years, then there's a good chance that the oil inside has evaporated. 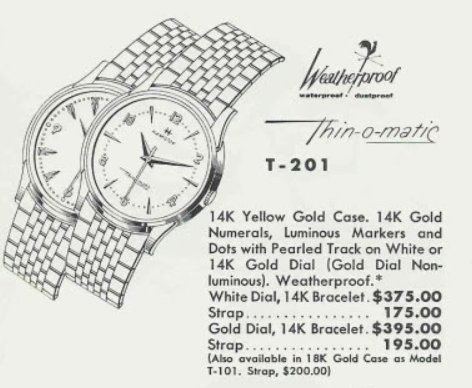 Even though a watch may look "new", if there's no oil inside then it will damage itself if you run it too long. The back of my project watch is as unremarkable as the front. The watch opens through the crystal and you have to separate the two-piece stem in order to remove the dial and movement. This 688 looks great, like it just left the showroom floor. The inside of the case back has no marks at all, other than a single finger print that someone possibly left 50 years ago. There are no watchmaker's marks inside. It's interesting to see the model number ends with 67. 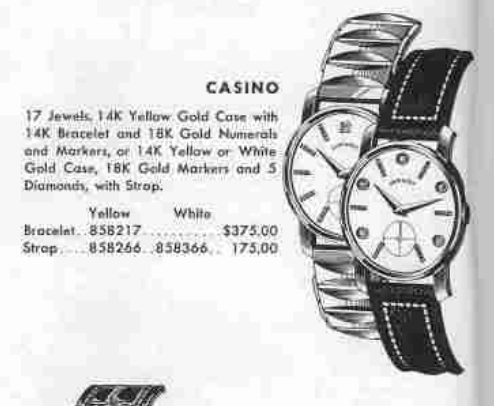 That would indicate that this is a 1967 model but there is no 1967 catalog to confirm the existence. There's only a 1966/67 catalog and the Seaward II isn't in it. 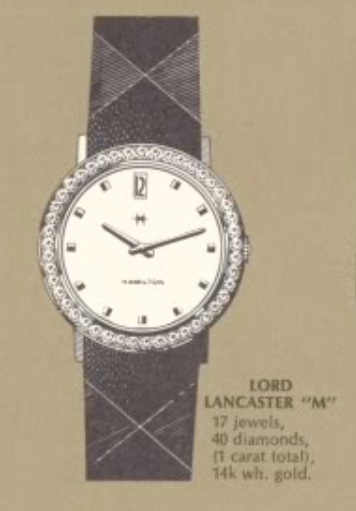 I think a 29.6mm crystal would be a perfect fit for this watch but I don't have one. The best I can do is a 29.8, which might be a smidgen tight but should work nonetheless. Everything is cleaned and laid out to dry before being reassembled. My reassembled movement looks as clean and sparkly as when I started but now I know there's oil inside to keep the parts lubricated. The balance is ticking away with good motion so it's off to the timer. It's running a little fast and the amplitude is a bit low but I haven't wound it all the way since there's no crown installed. After a little tweaking I've slowed the watch down and gave it a couple more winds. Things are looking good now. The fresh crystal and a new lizard strap give this Seaward II a new lease on life. The faceted hour markers really shine in my light tent and reflect all of the light outward. The only minor distraction that I can see is there's a tiny amount of corrosion on the second hand, but you'd have to look very closely to see it.